If you use Microsoft Office and you frequently work from different computers, you need to check out the Office Live add-in for Office Live Workspace (currently in public beta). This free online service gives you the ability to store and share up to 5GB of Word, Excel, and PowerPoint documents, and the Office Live add-in incorporates the ability to work with documents in the Office Live Workspace without leaving the comfort of your Microsoft Office app. Installing the Office Live add-on. The benefits of working with Workspace and its Office add-in are powerful. Without changing the way you work, your documents will follow you whenever you have an Internet connected computer running Office, and if you're away from your own PC, you can still access your stuff from any other machine. Additionally, Office Live Workspace makes sharing documents across the Internet trivial. Saving to an Office Live Workspace. Once you finish the installation, working with the add-in couldn't be simpler. 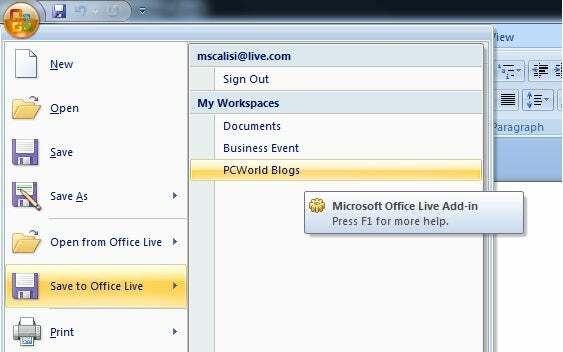 To open a document from Office Live Workspace, click on the Office Button (in Office 2007) and select Open from Office Live. After authenticating your Live ID, you'll be able to browse the Office Live Workspace as if it were your local file system. Saving files to the Workspace is just as easy, simply select "Save to Office Live". In Office 2003 and XP, the add-in puts Open and Save buttons right on your toolbar. There's even a version for Macs. It's included with Office 2008 SP2. In the Mac version, it's called Document Connection, and it can be found on the File menu under Open from Document Connection. 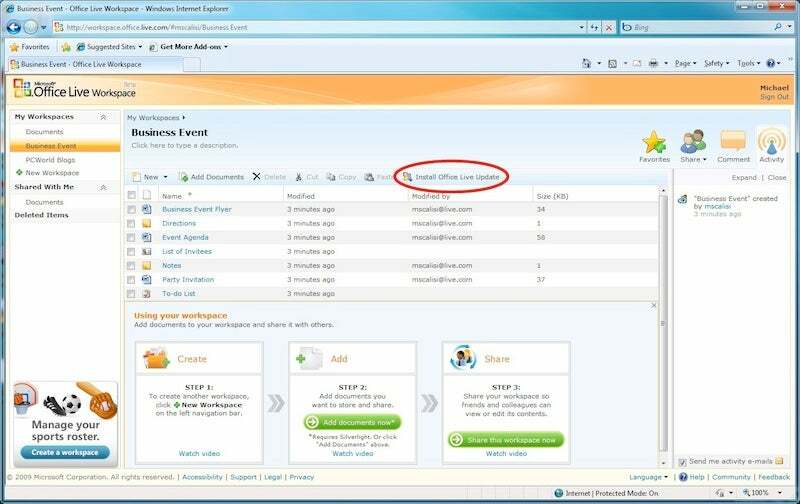 To access it, you select add a new location and then Sign into an Office Live Workspace. For those who bounce between different operating systems, it's somewhat frustrating that Microsoft chooses to make PC and Mac Office version so different. Still, it's convenient to be able to save a file from my PC and then open it on my Mac. While some people are incredibly organized when it comes to managing files, others are more haphazard about where documents are saved. By saving to the cloud service such as Office Live Workspace, it becomes easier to find files and manage different versions. Despite that Microsoft says Workspace is for managing Work, Excel, and PowerPoint documents, I had no trouble uploading other document types. This is important since projects don't often strictly include Office documents. Managing alternate file types requires working directly with the Office Live Workspace webpage. For people working strictly with Microsoft Office with a minimum of collaboration, this product is great. Although it allows for sharing documents over the Web, I find that for sharing and collaboration, Google Docs is still a more comprehensive solution. Unlike the Office Live add-in, Google Docs allows multiple users to simultaneously edit a single document, and it doesn't require all users to purchase a compatible version of Office. This may all change when Microsoft finally releases free web versions of its Office 2010 Suite. However, the offline abilities of Google Docs are rudimentary at best, and this is where Microsoft Office still shines.